Soli Inn Hotel started its service in 1992 and it's one of the best hotels around Guzelyurt. It has 5 bungalow type rooms and 16 standard rooms. All of the rooms have facilities like satellite TV set, mini bar, direct telephone line, safe case, bathrooms with shower and telephone line in bathrooms. Other than this it also has refrigerator and heater. At the entrance of the hotel there is a big lounge which is sometimes used as a restaurant/bar at any parties or functions. The hotel can accommodate 150 guests at the same time with great ease. The restaurants provide the customers with different variety of delicious foods and even various countries dishes are served. Bars allow them to have a great fun as live music entertaina all the time. 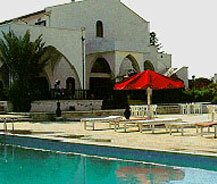 Soli Inn Hotel also incorporates a swimming pool which is designed beautifully with great care and there is a separate section for children where they can enjoy a lot and could have great fun. Nearby the Soli Inn Hotel there is a golf course which everyone can enjoy and as it is very near to the Inn, so guests could enjoy the privileges. This is the only golf course in the entire North Cyprus. All these make the Soli Inn as one of the finest hotels in that region.